Am I the only father who likes to do nothing much on Father’s Day? I doubt it. To all dads with a similar penchant, here’s hoping that you got your fill of “nothing much” yesterday—especially if you did a lot of it with your families. The New Jersey Fogdalls had a great time just building Legos, going to the park, walking along the lake, and eating hot dogs for dinner. 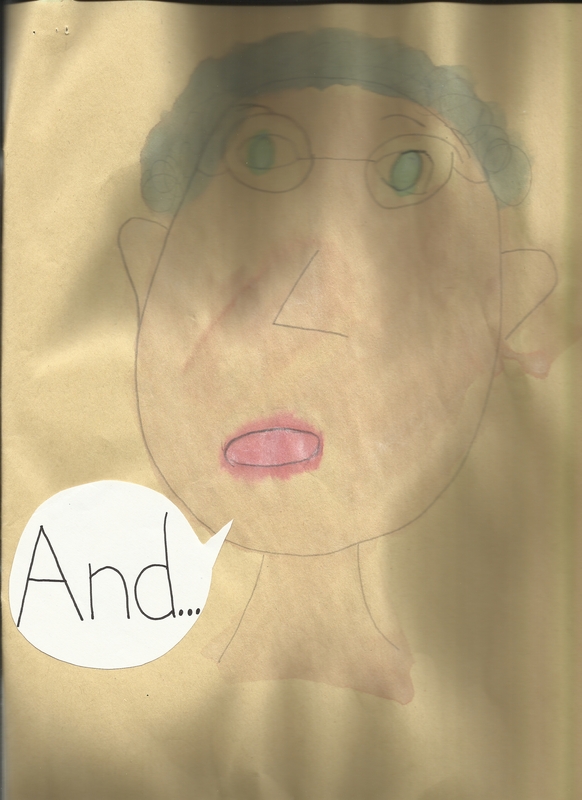 Most rewarding, however, were the portraits of me which my two kindergarteners had drawn in art class and which were presented to me Sunday morning. Simply yet lovingly rendered, these artworks also functioned as a reality check. Which is to be expected. 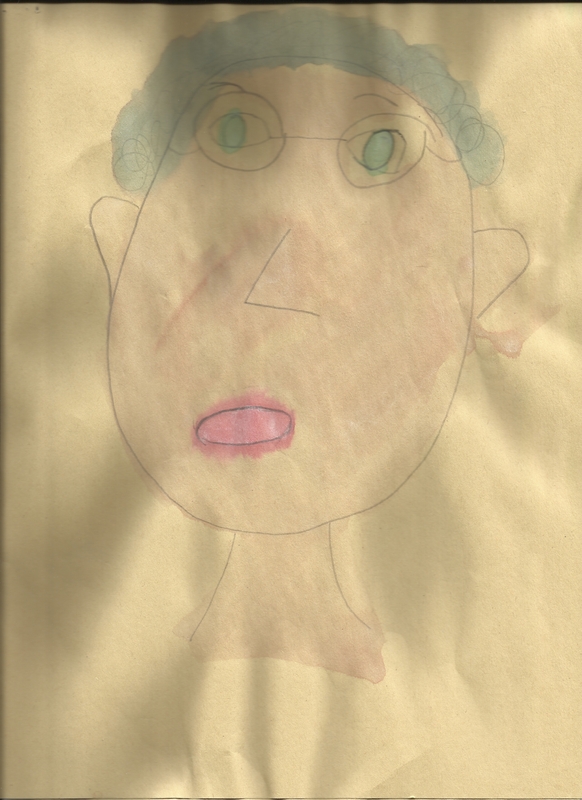 You don’t need a Harvard doctorate in art therapy to deduce your child’s feelings about you from such pictures. 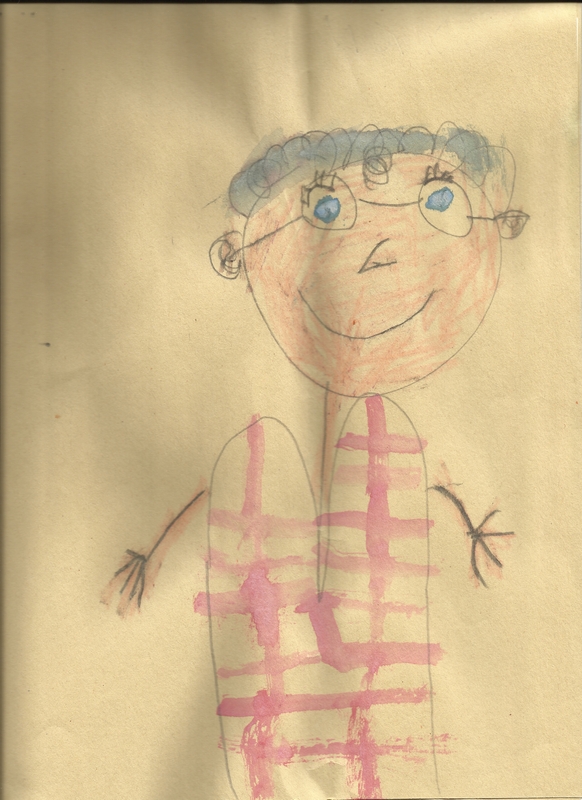 My older son’s drawing shows me grinning, arms stretched in evident welcome, and clad in a red plaid shirt. The shirt covers an oddly-shaped torso, which is indeed accurate—I developed scoliosis in my early teens—but instead of a curved spine the artist has added a pair of towering mammaries. We’re talking major upper-body restructuring here. I’m not sure I want to explore that angle any further, Dr. Freud. I mean I’m in touch with my feminine side and everything, but I won’t be signing up for that kind of surgery just yet. Perhaps there’s another reading (and any other reading would be great). Perhaps the scoliosis is rendered post-Cubistically, so that what you’d normally see in back is brought around to the front and accented by one of my emotionally escapist shrugs. It’s a distinct possibility. In any case, from somewhere down in the depths of that anatomical enigma my neck sprouts like a car’s antennae, straight and true, questing God. And at its zenith bobbles the cerebral orb, chomping at the bit to discuss science, movies, politics. Yes, a good likeness. Now for my daughter’s impression of me. Except first, let me make one thing clear—I’m crazy about all three of my kids, I’m mad for them, I pine for them. They’re like movie stars to me. I’m pretty sure they all know this, but my daughter’s temperament sometimes raises a smoke cloud, a sweltering mist of demands and tantrums through which we both flail and grimace and stumble before we find an equilibrium in our day-to-day relationship. (My wife may or may not second this description—I won’t speak for her here.) Bottom line is that my nearly-six-year-old super sweetheart likes to make an adventure of her affections. They are prizes to be netted, like exotic butterflies during a strenuous jungle safari. So I wasn’t shocked that in her picture I’m not smiling. I was disappointed, yes, but not shocked. She has captured me in a familiar state—working like a dog to win her over, to satisfy one stipulation or another. The non-grinning mouth looks as if it’s been punched. Its lips, puffed with psychological bruises, struggle to say something intelligent or maybe just to form a sound. Meanwhile the rattled, googley eyes search in vain for sympathy and justice. I have no limbs with which to defend myself. I can’t run away. I exist to serve. Her wheels turned a bit more, causing enough delay that I started feeling truly bad. Don’t push it beyond this point, I told myself. It’s a nice picture no matter what. I felt my real-life face blooming with a real-life smile and we left it there. It hasn’t been easy on these crooked bones, the year that has passed since last Father’s Day. It was a year of sleep deprivation, of middle-of-the-night spiritual crises, of diaper wads and doctor bills and pneumonia. But yesterday? What a celebration, what a feast for the spirit! Two of my favorite early 21st-century artists honored me, colored in my drab two-dimensional concerns, robed me in coveted finery. One wove around me crimson bands of comfort unraveled from his own beautiful soul. The other immortalized me in a role she frequently, almost nightly, insists I play: the storyteller. The dream supplier. The crafter of happy endings. That is one task that involves no appeasement, a task to which I readily, cheerfully yield.